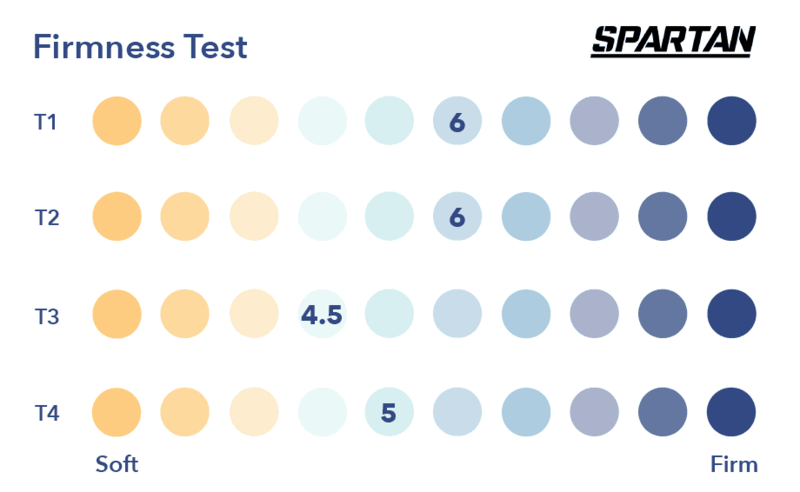 Brooklyn Bedding Spartan Mattress Review - Is This The Best Bed for Athletes? Whether or not you’re an ultrarunner matters less than what the mattress claims: Sleep on a Spartan, and you’ll reset and rejuvenate throughout the night. We’ll dive into how the mattress claims to do this, along with what you can expect to feel when hopping into bed. This hybrid comes in three different firmness levels, and today I’m reviewing the medium option. Continue reading below for my entire Spartan mattress review. If you’re short on time, simply click here to skip to the bottom for a handy summary. 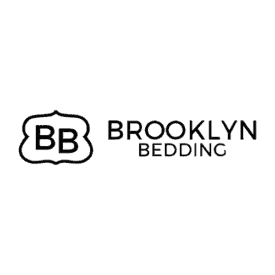 Use code SLEEPOPOLIS20 to save 20% off your Brooklyn Bedding order. Click the button to claim this deal. The Spartan Mattress is one of six mattresses by popular bed-in-a-box brand Brooklyn Bedding. 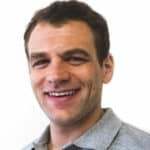 According to founder John Merwin, the company got its start in 1995, when he and his brother began deconstructing mattresses and visiting factories to figure out how to build a better mattress. Fast forward nearly 25 years, and the company has constructed a bevy of hybrid and mixed-foam mattresses to fulfill its number one goal of delivering luxury sleep at an affordable price. As a nice do-good bonus, Brooklyn Bedding also offers discounts to military personnel, first responders, teachers, and students. 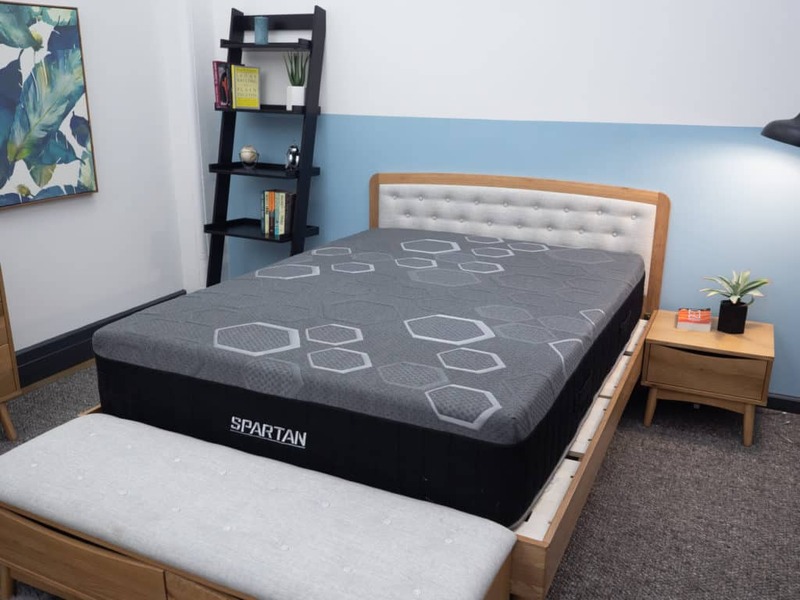 The Spartan Mattress is a 13.5” hybrid mattress made up of six distinct layers of foam and coils. As I mentioned before, this is the medium comfort layer option. The Spartan mattress is also offered in firm and plush. To see how the Spartan is built, let’s dive into each layer. 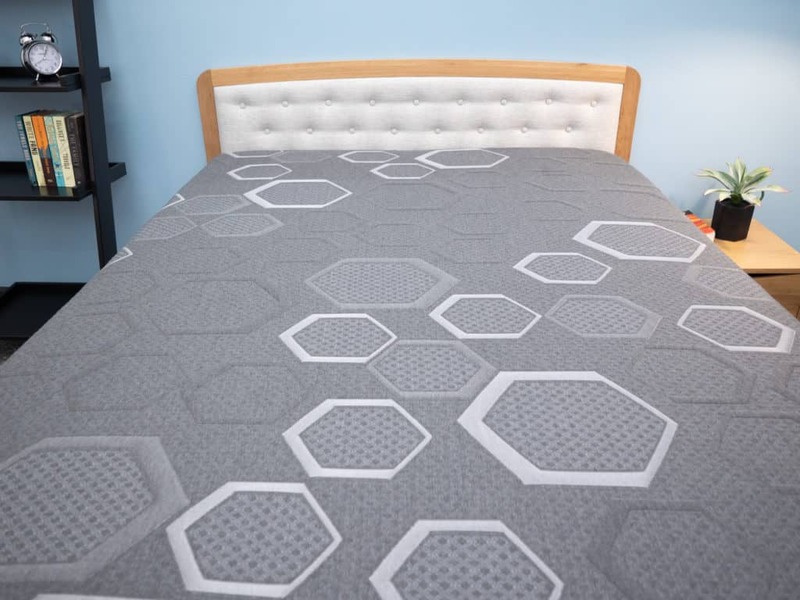 Cover – The cover is woven with performance fabric and Nanobionic technology that claims to “transform your body’s heat into waves of energy and promote deeper sleep.” This is why Brooklyn Bedding claims the Spartan is especially nice for athletes. Comfort Layer – This plush layer features 1.5″ of patented CopperGel Energex™ foam, which is essentially an alternative to latex foam. The Energex foam has a quick response to pressure so you won’t feel stuck in the mattress. The copper infusion could also keep you cool, since copper is known to help draw excess heat from the body. 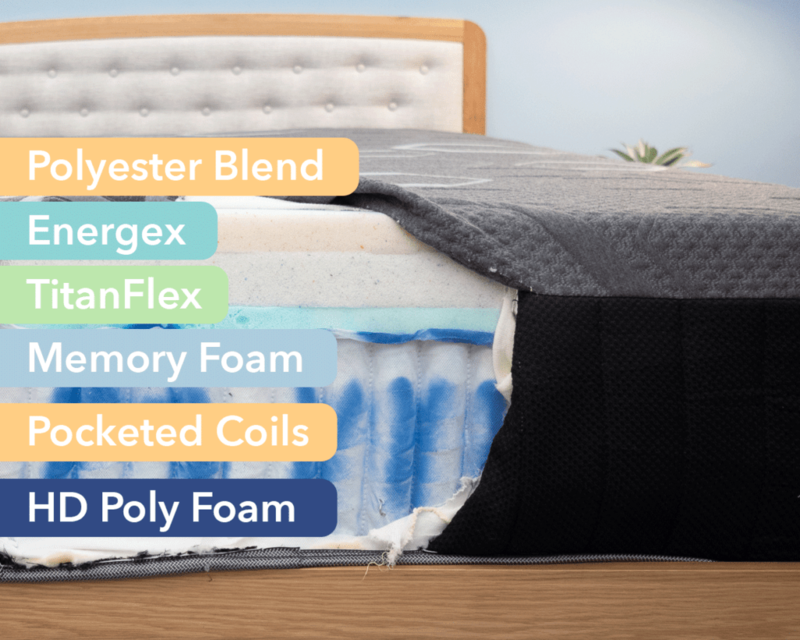 Transition Layer – Below the Energex™ foam is 2” of another type of foam unique to Brooklyn Bedding: TitanFlex™. TitanFlex is another latex alternative with similar qualities to the foam above it: quick response to pressure, good bounce, and ample mobility. All of this means you should be able to change positions freely throughout the night. Contour Layer – Yet another layer of foam. Under the proprietary foams is an inch of memory foam, which, in contrast to the Energex and TitanFlex foams, will have a slower response to pressure and hug your body. However, since this layer is pretty far down the mattress, you won’t feel too stuck, unless you’re a heavier side sleeper whose shoulders and hips sink deep into the mattress. A benefit of having memory foam this far down is it could dull some of the motion transfer from coils beneath it. Moreover, the placement underneath two latex-like layers could combat some of memory foam’s natural overheating properties. Support Layer – Below the foam is an 8″ support system of pocketed coils. This layer supports the mattress and should give off some bounce. Because the coils are individually wrapped, the springs will also isolate motion a lot better than traditional innerspring mattresses. 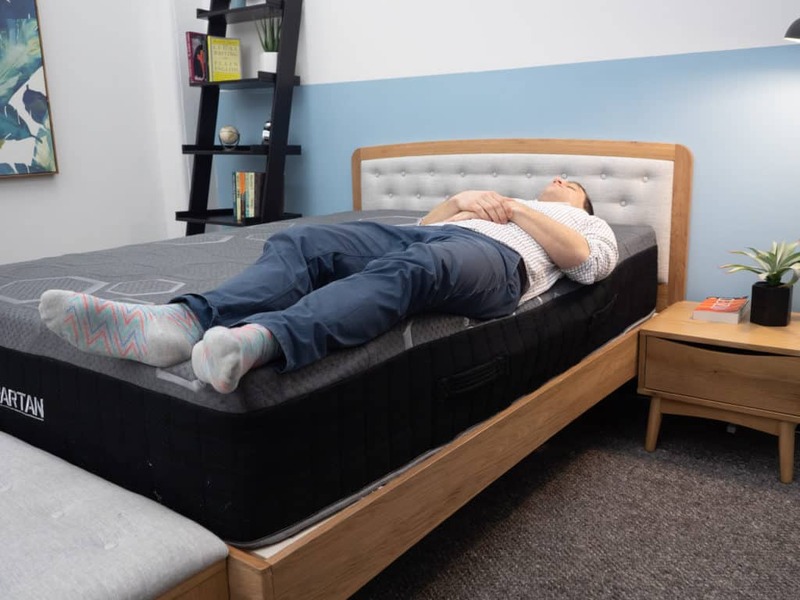 Base Layer – The bottom of this bed is constructed with 1″ HD Poly Foam, which acts as a foundation for the overall mattress while giving the coils something to press off of. Now that we’ve uncovered the mattress layers of the Spartan mattress, let’s look at its firmness and feel. I’ll break down what I experienced, which should provide a general idea of how you’ll also feel on this bed. And remember — am I a broken record player? — this is the “medium-firm” comfort option from Brooklyn Bedding. If you would like something softer or more firm, you can choose a different firmness level. All in all, I’d rate this between a 6 or 6.5 out of 10 on the firmness scale. When I laid down on my side, I sank a little bit, feeling ample pressure relief on my shoulders and hips. As I rolled onto my back, the foams did a nice job filling in the space at my lumbar region, keeping my spine well aligned. While the 4.5 inches of foam — including memory foam — led to some body contouring, I didn’t feel stuck. Said another way, this bed still had good mobility and a bit of bounce, so I could move around and change positions quite easily. Unlike other mattresses like Tempurpedic or Nectar, I didn’t feel too hugged. In general, I recommend this bed for back and side combo sleepers who need some pressure relief and support, but also want to freely change sleeping positions. Lastly, this bed features a quantum edge system, a type of pocketed coil system that has smaller coils near the sides to promote edge support. It did an excellent job of supporting my weight near the side of the bed. In general, a healthy dose of edge support is a big plus for couples; this helps make the bed feel bigger, and you’re able to utilize the entire surface area of the mattress without feeling like you’re falling off. Overall, the Spartan has a true medium-firm feel, with extra softness and sinkage from the thick and foam-filled comfort layer. While I felt pretty comfortable in every sleeping position, stomach sleepers might want to try the firm option to get more hip and stomach support. The Firm version of the Aurora mattress might also be a nice choice for belly sleepers! Another way to determine how the Spartan Mattress will feel is by seeing where pressure points might form after weight is placed on the bed. Like any good warrior, the Spartan was willingly put to the test. I got out my handy pressure map, which can visualize where these points of tension could pop up, and placed the map on top of the mattress. From there, I lied on my back, side, and stomach. Back – As you’ll see, there was pretty much blue across the board, indicating my weight was evenly distributed and no pressure points formed. There was a little bit of green around my shoulders, indicating some raised pressure, though I generally felt fine on my back. All in all, back sleepers should feel well supported on the Spartan thanks to the mix of bounce from the coils, mobility from the proprietary foams, and some soft sinkage due to the memory foam. Side – As I rolled over to my side, you’ll see some pressure that’s formed around my shoulders. While I didn’t feel a significant amount of discomfort, it’s natural for some pressure to form whenever shoulders start to sink into the mattress. Even though I felt comfortable, it’s worth noting the map did detect some points of tension. Stomach – On my stomach, there was mostly blue on the map. My weight was evenly distributed, yet I do believe this mattress is a little too soft for strict stomach sleepers who might need something more firm to keep their hips from sinking in too far. Another thing you’ll want to know before buying a new bed is whether you’ll feel like you’re sinking “into” the mattress versus lying “on top” of it. I did experience some sinkage and contouring, so I wanted to also visualize this sinkage via another test. I placed four balls of varying sizes and densities (a 6 lb medicine ball, a 10 lb steel ball, a 50 lb medicine ball, and a 100 lb medicine ball) on the mattress and measured how much they compressed the surface. The graph above basically shows an average amount of mattress sinkage. This means you’ll sink a bit into the bed, but will also be well supported in order to keep your spine well aligned (so long, AM aches and pains!). This nice balance comes from the combination of an 8” springy coil system and 3.5” of quick response foams, coupled with an inch of slow-response memory foam. Said another way, you’ll probably get a satisfying mixture of support and pressure relief on the Spartan. I also ran a quick bounce test with the 10 lb steel ball to test how mobile one might feel on the mattress. The ball caught some air when I dropped in on the mattress, indicating the Spartan responds well to pressure and you shouldn’t feel too stuck in the bed. 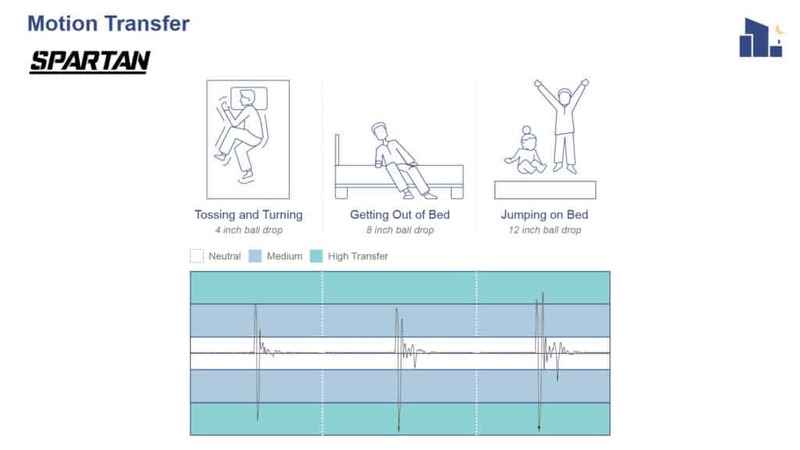 Lastly, the motion transfer test can indicate the amount of disturbance you’ll feel from one side of the bed to the other. This is especially important for people who share your bed with a partner who likes to toss and turn throughout the night. The results revealed an initial spike in motion that was dulled quick quickly, most likely due to the layer of memory foam and individually wrapped coil system. This means that while you might feel some initial motion when someone jumps into bed, that disturbance will fade fast. Given the amount of mobility you’ll likely experience on this mattress, I was overall impressed with how quickly it isolates motion. 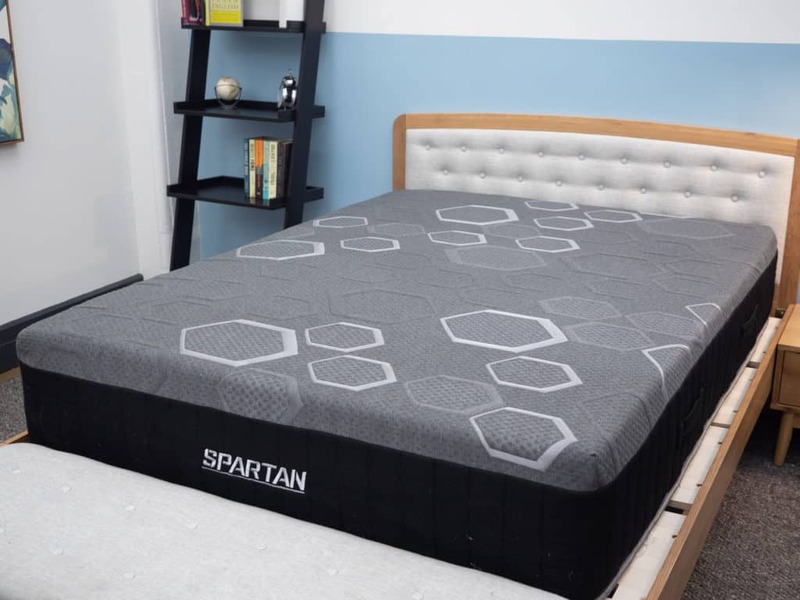 Is the Spartan Mattress Right for You? 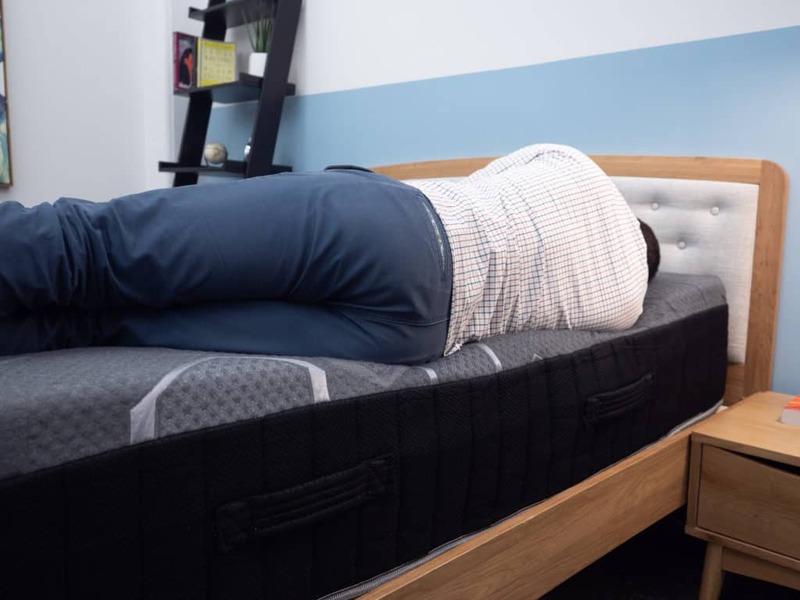 Now that we’ve tossed and turned on the Spartan mattress and conducted various tests, here are some recommendations and things to watch out for. You want good bounce. The Spartan mattress strikes a nice balance of providing plush pressure relief while also being a bit bouncy. If you want to feel some sinkage, but don’t want to feel stuck in the mattress, the Spartan does the trick. You’re a side and/or combo sleeper. Because of this mobility, Spartan could be an especially wise choice for combo sleepers who need to move around freely through the night. Side and back sleepers will fare best on this bed since the plush support provides pressure relief for the low back, shoulders, and hips. You share the bed. Whether with a partner or pet, sharing a bed means you often need to utilize the entire surface area. 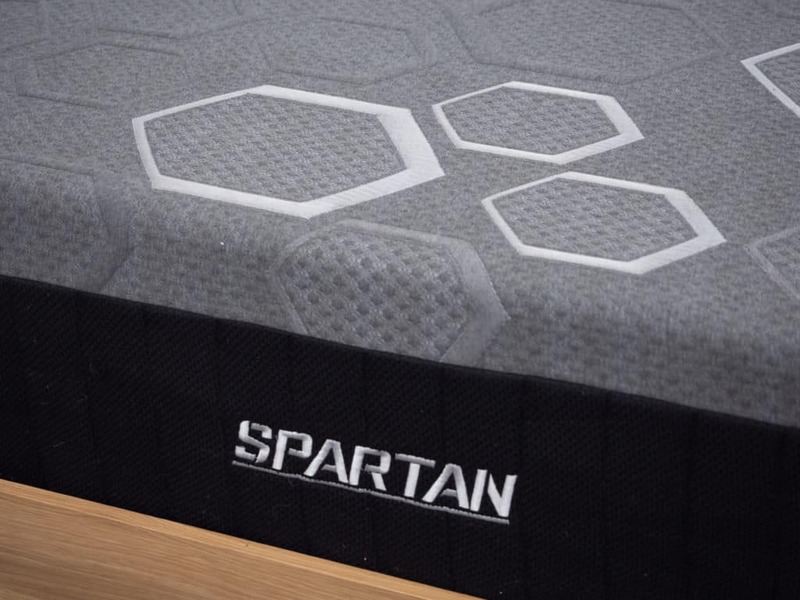 The Spartan has great edge support, so you most likely won’t feel like you’re rolling off the mattress. 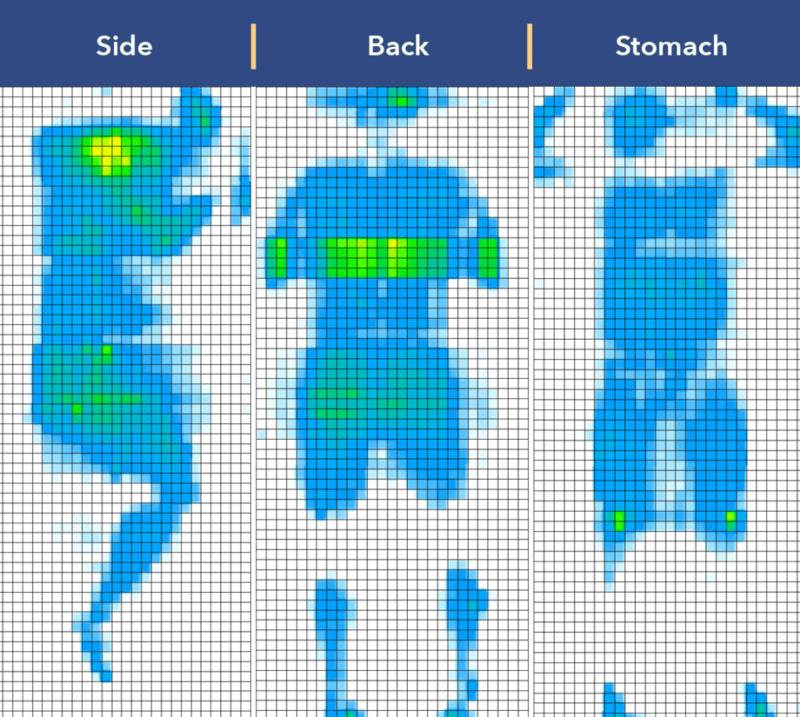 Stomach sleepers might not get enough support. This mattress is definitely a touch softer than traditional “medium-firm” mattresses, so you probably won’t get the support your hips need if you sleep on your belly. Luckily, you can choose the firm version of the Spartan to hopefully get the strong structure you need. The Spartan sleeps a little warm. Memory foam is infamous for trapping heat, and unfortunately, the Spartan does get a little hot. If you need a cooling mattress, the Spartan might not be the best choice. It’s a little on the pricey side. While Brooklyn Bedding prides itself for offering luxury mattresses at an affordable price, its price point of $2K for a queen does seem to be on the pricey side, especially in comparison to other Brooklyn Bedding offerings. If you’re convinced the Spartan mattress is a fit for you, check out the size and pricing information for the mattress below. Aurora — sleeps cool and has great bounce! That’s it for me and the Spartan review! Feel free to leave me comments and questions below.